The following files are available for download by clicking below. The items are detailed below if you do not have Word or Adobe available. To educate the public about the history, ethics, and future of sport-fishing, manufacturing ingenuity, and popular culture through the study, preservation, collection, and promotion of fishing reels from the earliest times through the present day. To become the focal point for all collectors who are interested in the history of sport-fishing and fishing reels. To promote interest in the history of sport-fishing and of fishing reels to the general public. To provide services and events that address the interests and continuous collecting and educational growth of our members. To communicate with members as efficiently and effectively as possible. To be an economically and participatory responsible and sustainable club. To actively communicate and cooperate with other prominent sport-fishing history-related clubs and organizations. Increase total membership by 10% per year, with at least 20% of new members being <18 years old and 40%<40 years old (1, 5). Double international (non-U.S.) membership within the allotted period (1, 4). At least double the number of members who hold assigned or elected positions within the club (3, 4, 5). Have a succession plan and/or backup personnel for all key staff (with key staff identified through concurrence of ORCA officers and Board) (4, 5). Corporate sponsorship and grants (5). Youth organizations (1, 2, 3). 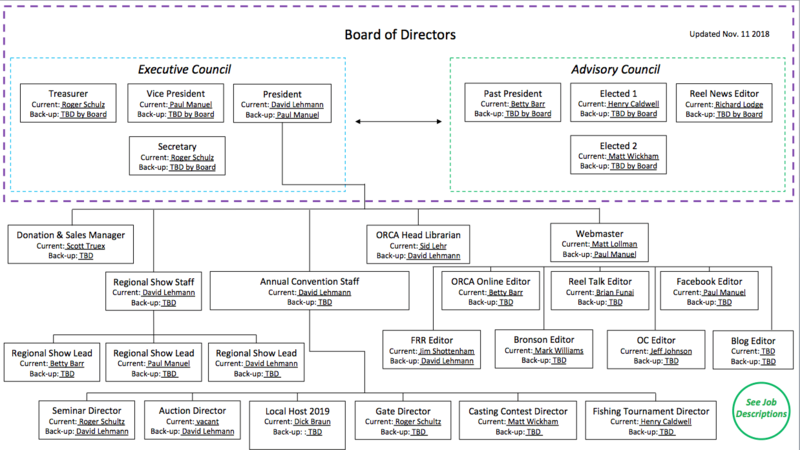 Develop a Press Release and a related Marketing Plan plan to announce the new ORCA Administration with the main objective of promoting the Club’s Purpose, Mission and 501(c)(3) status. To survey existing and perspective members regarding their impressions of club accessibility, relevance and performance (1, 4, 5). To sponsor at least three regional ORCA member events in 2017, four in 2018, and five in 2019 (1, 3, 4). At least one of the shows should be held outside of the U.S. in support of Key Initiative on non-U.S. membership growth. By 2019, the financial objective for each show to break-even through registration, auction revenues, and table fees. To maintain and improve as necessary the quality, efficiency, and accessibility of current club services (3, 4, 5). To increase the number of contributing authors for the Reel News and encourage the development of articles (1, 2, 3, 5). To make membership in ORCA desirable through access to member-exclusive services and opportunities (1, 3, 5). To enhance electronic accessibility and ordering of the ORCA catalog library. At least once each year, challenge existing members to organize and install short-term mini-reel history displays at their local library/community center/school facility. At least once each year. challenge existing members to include a (self-printed) paper copy of the ORCA membership flyer inside their shipments of reels sold, regardless of the selling platform e.g. eBay, Facebook, private sale (1,2,3,5,6). At least once each year, challenge existing members to add links on their own reel websites to the ORCA site (2, 4, 6). Improve internal financial management planning (5). · Oversee all Club activities and correspondence. · Develop and oversee the implementation of a Strategic Plan. · Provide open and timely communication to all Board members about potential or planned ORCA activities and actions. · Work with Vice President and obtain consensus agreement (or consensus compromise) among all manners brought in front of the Board. · Communicate with the Vice President on at least a weekly basis and with the Executive Board on at least a monthly basis. · Work with the Secretary/Treasurer regarding finances, expenses, income and correspondence. · Consult and obtain majority opinion of the Board in all matters pertaining to Club activities. · Write a President’s Message in each issue of Reel News. Send to the Editor the 5th of the month before publication. · Promote and implement sustainable programs to grow membership of the club. · Direct and implement ongoing membership assessment. · Recruit and oversee staffing of volunteer positions and facilitate effective performance of volunteer positions by helping to identify and rectify task-performance obstacles. · Direct and implement corporate sponsorship programs. · Select annual meeting venues, direct planning activities, solicit auction items, and staff appropriately. · Promote and represent ORCA’s best interest through interactions with other sportfishing and collector organizations, as well as potential corporate sponsors. · Communicate with at least one ORCA member via phone call or face-to-face conversation every week and at least 50 different members in a calendar year. · Communicate with the President on at least a weekly basis and with the Executive Board on at least a monthly basis. · Make reasonable efforts to be aware of pending and ongoing actions and activities of ORCA. · Cover President duties, if the President is unavailable or incapacitated. · Work with President to identify and address current and potential ORCA members’ best interest. · Communicate with the Executive Board on a monthly basis. · Maintain records of all Board meeting. · Maintain records of communications done via email. · Answer inquiries from ORCA Members and/or direct inquiries to appropriate ORCA personnel within two working days. · Maintain files of all old records from when ORCA originated. · Provide historical guidance to Officers and Board members. · Maintain an up-to- date membership application. · Answer questions on Reel Talk related to my duties. · Maintain and store back issues of the Reel News (27 boxes). · Fill orders from members requesting back issues. · Provide a storage space for all ORCA related materials and items. · At least two trips to the Post Office each week sending ORCA related orders and materials. · Maintain a database of members, including membership standing. · Maintain a database of Honorary members and Life members. · Maintain a spreadsheet of members who pay multi-year renewals. · Prepare information that will be included in the ORCA directory and provide to the Editor. · Send out renewal requests to members each year. · Communicate with members regarding the status of their dues. · Set up a PayPal account for members to pay via PayPal. · Maintain four accounts: Checking, Money market, Certificate of Deposit and Life members. Money market account would contain mullti-year membership and other funds. · Provide quarterly financial reports to the Board. Provide an annual financial report to the membership. · Provide information on 1099s to tax accountant. · Provide information to tax accountant for income tax purposes. · Maintain West Virginia tax certificate and annual report. · Provide a copy of the monthly bank statement to the President. · Pay all bills that are presented to ORCA. · Provide a membership packet to new members. · Maintain the financial function with all ORCA-owned websites and with the sale of reels on eBay by ORCA. · Maintain books sales, clothing sales, and other items sold by ORCA. · Communicate with ORCA Online editor, so that advertised ORCA Store information and inventory are current. · Select a new patch each year and work with its design. · Provide guidance to assist in managing ORCA’s affairs in a fiscally sound and responsible manner. · Establish club policies, rules and guidelines. · Sponsor, sanction and support all ORCA activities in a timely manner. · Attend four Board meetings per year and ad hoc meetings (including electronic meetings) on an, as needed basis. · For two elected directors, learn duties of, and train for future participation in Executive Board. · Vote on motions brought to the Board. · Appoint and vote on replacements for other Board members, on an “as needed” basis. · Work with the President on preparation of the Annual convention. · Attend the ORCA Annual convention. · Publish the Reel News six times per year. · Coordinate with members on ads for the Reel News. · Provide digital copies to International member when requested and when their dues are at the reduced rate. · Coordinate the mailing of the Reel News upon receiving labels from the Secretary/Treasurer. · Maintain a checking account to pay postal costs. · Attend annual conventions to cover the event for the next issue. · Solicit and Maintain a variety of articles to cover all fishing reel types. · Notify the Secretary/Treasurer of author and fee to be paid for each article. · Work with authors to better refine their articles. · Proof all articles that are printed in the Reel News. · Proof final layout of Reel News prior to printing. · Maintain an electronic file of all Reel News articles. · Look for new innovative ways to improve the overall appearance of the Reel News. · Provide end of quarter and end of year information to Secretary/Treasurer. · Communicate all significant changes in format or content for concurrence to the Board of Directors, prior to implementation. Editorial Assistant · Provide QA/QC review of articles prior to final layouts and of final layouts prior to going to press. · Assures stylistic and quality consistency between the websites. · Sets up a Website Committee of ORCA members. The members are the Committee Chairs (called Editors) of the 4 different sites listed above. · Works with eLink Design in Lexington KY to add features and upgrades as determined by the Board and the Website Committees. · Reports to the Board any recommendations about the planning, usage and implementation of web resources. · Evaluate, secure and monitor web hosting services. · Trouble shoot during outages and slowdowns. · Communicate webpage strategic and staffing plans to the President. · Assure payments are made to hosting services, vendors and eLink Design. · Check that domains are kept up to date. · Deleting, deactivating, and editing member profiles to meet Reel Talk standards. · Editing or deleting posts to meet Reel Talk standards. · Manipulation and editing the forum itself to create, rename or change order of sub-forums. · Review, screen, and approve new users. · Work with the ORCA website company (currently eLink Design in Lexington, KY) to update, upgrade and fix problems with the platform and template. · Staff a committee of at least two moderators. · Along with the moderators, review all posts in a timely manner, and remove personal information as well as inappropriate or offensive language and subject matter. · Working with the webmaster, develop and implement a strategic and staffing plan for your webpage. · Develop and maintain webpage styles that are consistent with ORCA Online. · Review all posts in a timely manner, and remove personal information as well as inappropriate or offensive language and subject matter. Moderators can delete posts that are deemed to be inconsistent with Reel Talk standards. · Periodically review the content and edit and update as necessary. · Add new content on What’s Hot, especially for each new issue of The Reel News, describing featured articles and adding photos. · Add events and keep the National Convention information current with news, events and photos. · Remove expired links and outdated information. · Add and remove ORCA store items. · Appoint staff, as needed to assist with these duties, and provided staffing information (people and assigned duties) to the President. · Solicit information (text and photographs) for the website. · Vet provided information for accuracy prior to posting on live website. · If accuracy of information is controversial, provide all broadly accepted controversial opinions with appropriate attributions. · Update website content as new information becomes available. · Recruit and implement additional support staff, as necessary. · Identify high interest and original posts which show promise for Reel News articles and act as bridge and catalysts between poster and Reel News editor. · Assist the President by visiting and collecting information from venue sites. · Be phone-accessible to potential ORCA convention attendees for three months prior to the convention and during the convention. · Provide ORCA members local information, as requested. · Assist the President in distributing convention advertisements and information to retail businesses, sportfishing organizations, youth groups, and local media. · With the assistance of the President and Auction Coordinator, help solicit auction items from the general public by providing information about the auction on an “as needed” basis. · Identify and meet with youth groups to recruit their participation and attendance to the Convention, starting at least three months before the Convention. · Assist the President in identifying potential local sponsors and stakeholders for the Annual Convention. · Be phone-accessible to potential non-ORCA convention attendees for one month prior to the convention. · Along with the President, select the location of the fishing tournament. · Promote the event through webpage and social media posts and via direct contact with Annual Convention registrants. · Staff the event, as necessary, with volunteers. · Working with the President, develop and track an event budget. · Select and acquire prizes. · Direct non-showroom inquiries to the appropriate locations and ORCA contacts. · During ORCA-only access periods for the showroom, assure that all people attempting to enter the showroom are member Convention registrants. · During the public access period for the showroom, collect registration information and fees, and assure that all people attempting to enter the showroom have registered. · If unauthorized people attempt to enter the showroom without registering, notify facility security and the ORCA President immediately. · Along with the President, select the location of the casting tournament. · Develop a schedule for the event that has at a minimum . · Identify and schedule resources needed for the event (lawn space, tape measures, etc.). · Along with the President, select times and locations for seminars. · Solicit seminar presentation topics, representing breath of ORCA members’ interest and local sportfishing history from ORCA members, and present seminar. · Along with the President, select the seminar topics that will be presented at the convention. · Using social media and word-of-mouth, actively promote scheduled seminars and the Annual Convention to ORCA members and potential ORCA members. · Act as the primary contact for those presenting and interested in attending seminars. · At least six months before the Annual Convention, collaborate with the ORCA President about auction logistical details (room size; auction(s) timing; auction item submittal, storage, and display; etc.). · With the assistance of the ORCA President, solicit donated auction items. · Staff the event, as necessary (auctioneer, item submittal personnel; walkers, etc). · Working with the President, develop and track an auction budget. · Maintain the digital and hardcopy library. · Solicit and acquire new items (reel catalogs, owner manuals, etc.) for the library. · Until the library catalog is current, input at least two currently uncataloged resources per week into the library catalog. · Update the library catalog as new resources are added to the library. · Recruit and acquire volunteer staff, as needed. · Assess the time (if done in-house) and cost (if contracted) of digitizing the ORCA library. · Solicit donation of reels and ephemera for on-line (typically eBay) auctions and for annual silent auction. · Maintain item-level records of auctions (necessary for club and donor tax purposes).